Basecamp records the activity of everyone in your account. 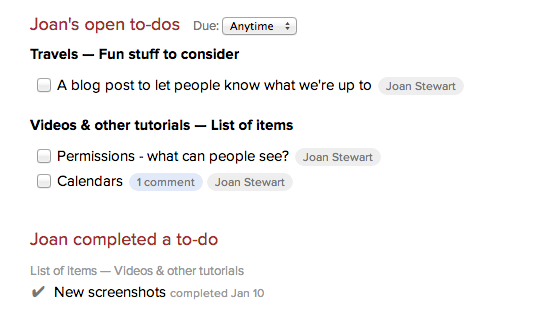 You can also see completed and outstanding tasks, so you always know who's been working on what! Click "Everyone" to find and then click on the person. You'll see the last six entries of that person's activity. To see more, click "See all." To-dos are organized by project, and separated into outstanding tasks and completed tasks. You can filter for tasks that are due today, tomorrow, etc. See every file this person uploaded to your account. You can only see activity, tasks, and files associated with projects you have access to.